The population of the region was reported as 380,256 by the census of 2009. Of them, 24.2 per cent lived in the region's four towns and five urban-type settlements, and 75.8 per cent in the rural areas. The majority (76.5 per cent) of the regione's population are Kyrgyz; there are also Uzbeks (14.7 per cent) and Tajiks (6.9 per cent), as well as a few Russians (0.8 per cent), Tatars (0.4 per cent), and Turks (0.2 per cent). So'x (or Sokh) (40°02′39″N 71°05′39″E) is an exclave of Uzbekistan, about 24 kilometres east of Batken. 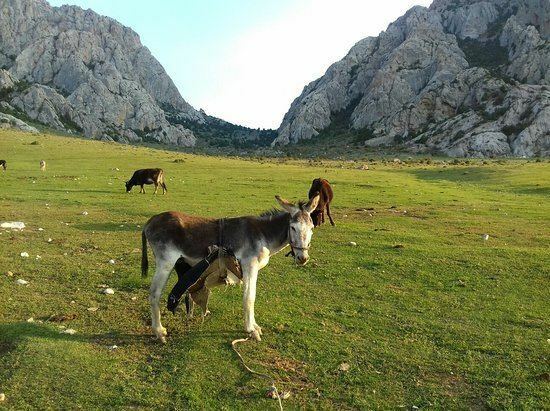 The largest of the exclaves, it has an area of ~234 square kilometres, stretches from 3 to 13 kilometres from east to west, and about 35 kilometres north to south, and is crossed by the main highway from Batken to Osh. Tajiks comprise 99 per cent of the population, which in 1993 numbered 42,800. Jani-Ayil (also Dzhangail, Jangy-ayyl or Khalmion) (40°12′01″N 71°39′43″E) is a small exclave of Uzbekistan, about 60 kilometres east of Batken and within 1 km of the Uzbek main border. It measures only 2 to 3 kilometres across. Kayragach (40°04′05″N 69°32′41″E) is a very small exclave of Tajikistan, located in the northwest corner of the region near the railway station of Stantsiya Kayragach, about 130 kilometres west of Batken. 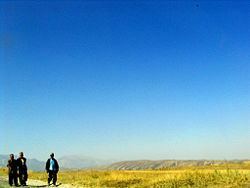 The border separates it from the Tajik town of Qal'acha; hence it is sometimes called "Western Qal'acha." Shohimardon (39°58′59″N 71°48′18″E) is an exclave of Uzbekistan, about 80 kilometres east of Batken and 19 kilometres south of the Uzbek border. It has an area of ~38.2 square kilometres, and a population in 1993 of 5,100. Uzbeks comprise 91 per cent of the population. Vorukh (39°51′04″N 70°38′00″E) is an exclave of Tajikistan, with an area of ~96.7 square kilometrers, located 45 kilometres south of Isfara and 24 kilometres southwest of Batken, on the right bank of the Karafshin River. The population, distributed among 17 villages, is estimated to be between 23,000 and 29,000, 95 per cent of which are Tajiks and 5 per cent Kyrgyz. Until recently, travel by foreigners was not recommended because of security problems. To travel between Osh and Batken the road crosses the So'x enclave, which requires a double-entry Kyrgyz visa and an Uzbek transit visa: it is possible to take an unmetalled road around the enclave. The southern mountains offer excellent, but very difficult climbing with many sheer rock faces. Summits are Pyramid Peak [5,509 meters (18,074 ft)] and Pik Skalistiy [5,621 meters (18,442 ft)].